WP Achievements and WP Courseware can be used together to enhance student interaction in your online courses. 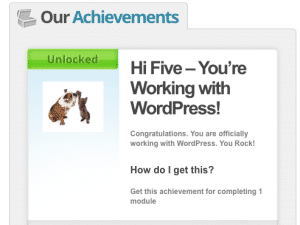 WP Achievements is a WordPress plugin that allows badges and points to be awarded for tasks ranging from adding comments to reading posts. This is one way to add gamification features to your course. See Gamification in Online Courses for more information. Using WP Achievements and WP Courseware together lets you add badges and points to courses built using the WP Courseware plugin. This includes achievements for the completion of quizzes, modules, and courses. A plugin add on for WP Courseware is used to provide this functionality and extend the features of WP Achievements. The WP Achievements plugin provides the option to grant points and badges based on specific tasks. The free version includes achievements for reading posts, adding comments, and logging into the site among others. A premium version is also available that extends the functionality to include bbPress and achievements for entering or answering forum topics. When used with WP Courseware, a plugin extension is required to allow the integration between WP Achievements and WP Courseware. You can select to display available achievement badges to motivate students to gather the badges and points associated with them. Your Achievements page is set in the plugin settings. This page can then be linked to from the menu for easy access. You can display the achievements that have been earned on a Member’s Page or other area of the site. These can be entered in the site using a shortcode. 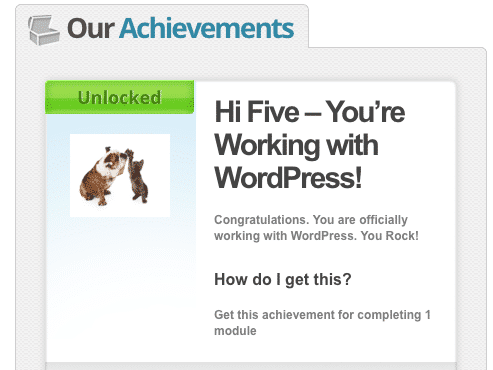 To create an achievement, go to the WordPress Dashboard. Depending on the settings configured by the site administrator, you may need to be an administrator to create or edit Achievements. In some cases, access is granted by the administrator to other roles. From the Dashboard, select WPAchivements. This opens the page that displays the current achievements. Click the Add New Achievement button at the top of the page. Enter the name of the achievement and the description of the achievement. Select the Trigger for the achievement. For example, passes a quiz. You may, optionally, set an ID for a course, module, or quiz, if you want this to only apply to a single one. Select if you want it to recur. Set the number of occurrances that the student can receive this achievement. Add a number of points to the achievement. At the top of the page, you may either upload an image to be used with the achievement, or select one of those provided. Select Publish to finalize the creation. Achievement badges and points can help motivate students to complete the course and can increase interaction. Coming soon, we’ll look at using BadgeOS, another achievement plugin, along with LearnDash to add achievements to more online courses.